Why waste money on roses and chocolates when you can give the-love-of-your-life a pretty red appliance that she’s always wanted. Does she love KitchenAid products? Does she love red in her kitchen? If you’ve answered “Yes” then it’s time to start shopping. Here are the best KitchenAid red appliances for any home. The first big decision when you’re looking at KitchenAid red appliances is whether you prefer Empire Red or Candy Apple Red. KitchenAid red appliances come in both red colors in a number of different products. 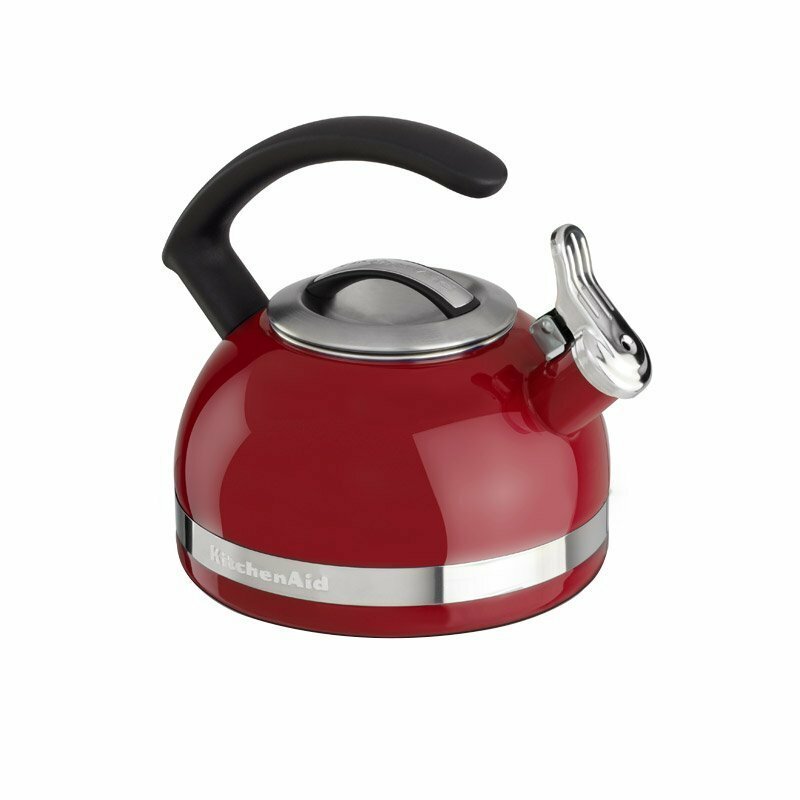 This Candy Apple Red KitchenAid EK1522CA Electric Kettle (see image below) lets you control temperature for the perfect cup of tea or coffee. The temperature gauge lets you see the exact temperature reading. It also has dual wall construction to hold the temperature for longer. You’ll love the 1440 watts of power to boil quickly. It’s also a quiet kettle. ⇒ For more details on this electric kettle, Click Here. 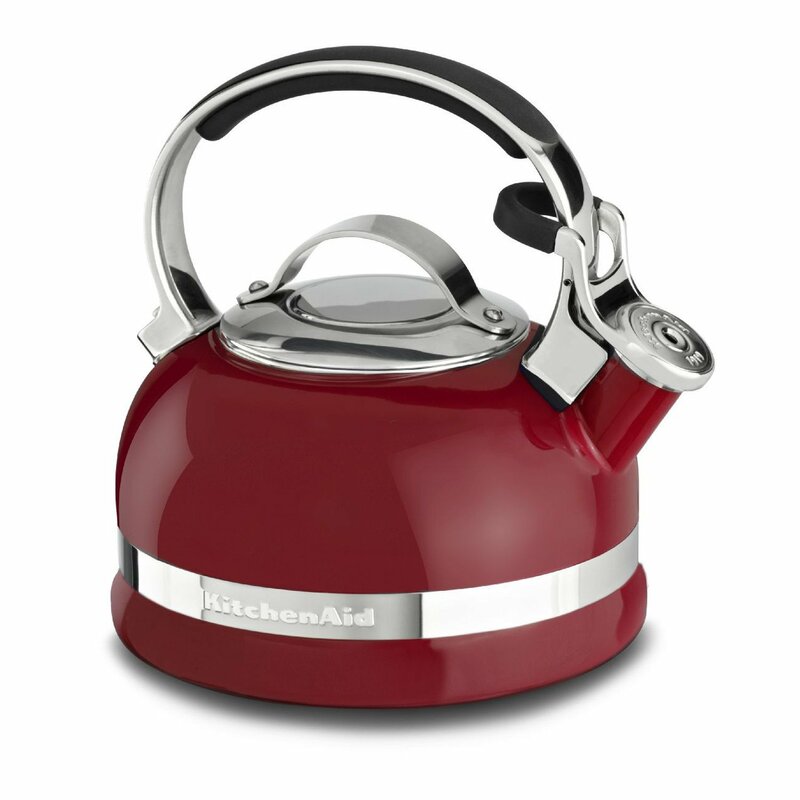 If you prefer the Empire Red shade of red then take a look at this modern styled electric kettle. The KitchenAid KEK1722ER Electric Kettle (see below) comes with a LED display. Also, it has a 1.7 liter capacity but you can heat as little as 250ml of water if you prefer. You can vary the temperature settings between 122°F and 212°F. And the temp will hold for up to 30 minutes. Very handy if you’re distracted by kids or pets before you get a chance to make your cup of tea. 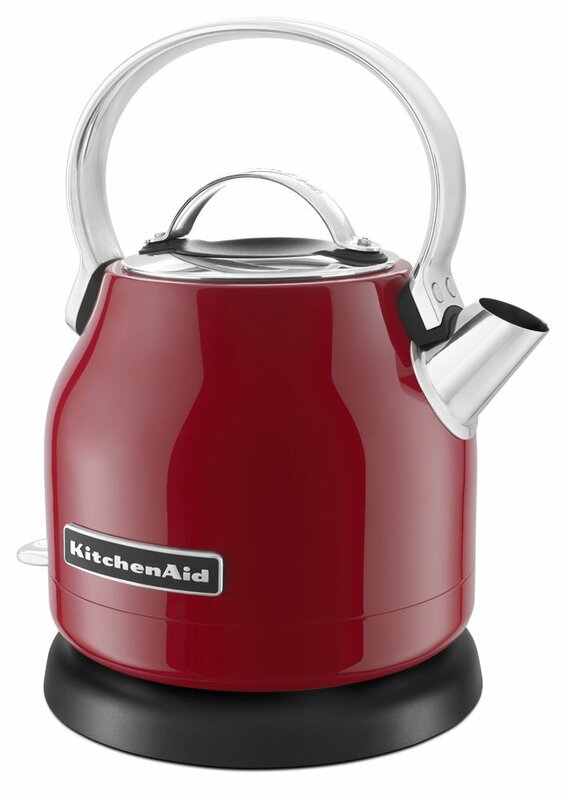 If you like your KitchenAid red appliance to be easy to use you’ll love the soft grip comfort handle on this kettle. It’s designed for maximum comfort and performance. The body of the kettle is made from stainless steel. ⇒ For an excellent price on this KitchenAid kettle, Click Here. Need your KitchenAid red appliances to be a little bit smaller? 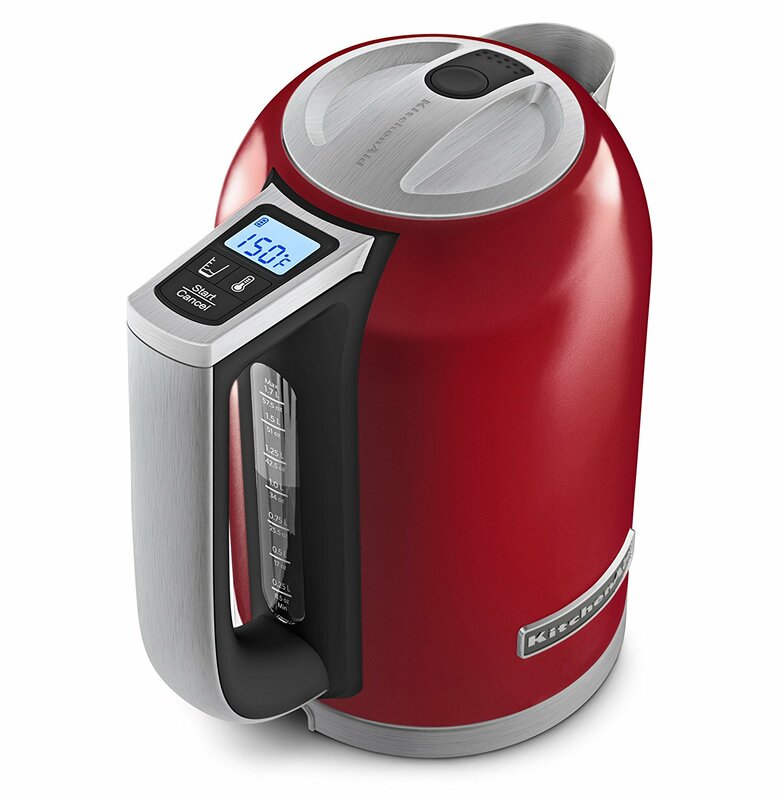 This KitchenAid KEK1222ER Empire Red Electric Kettle (see below) has a 1.25 liter capacity. ⇒ Looking for a good price on this KitchenAid kettle? Click Here. 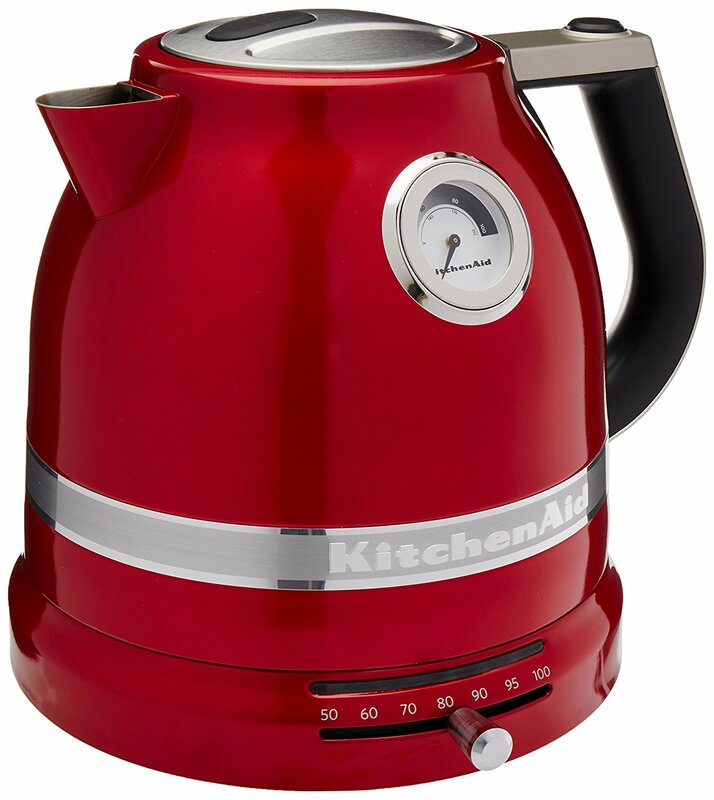 This retro styled electric kettle features a smooth aluminum handle with a stainless steel body. This Empire Red kettle is popular with people who have a smaller kitchen. It offers a stylish electric kettle with a smaller footprint so you’ll save space on your counter. If you want a kettle that boils fast, this is it. This KitchenAid KEK1222ER (1.25 liter) boils a full kettle of water faster than the KitchenAid KEK1722ER which holds 1.7 liters. Do you prefer a stovetop kettle? When you’re looking at KitchenAid red appliances, you want modern convenience with retro styling. This kettle has it all. This iconic Empire Red kettle is perfect in any kitchen. It works on gas hobs, electric coil hobs, glass electric stovetops and induction stovetops. The bottom of the kettle is flat so it’s in contact with induction and glass stovetops. ⇒ Click Here for all the details on this stovetop kettle. You’ll get 2.0 Quart capacity. The handle is full stainless steel with a comfort grip. You’ll love the removable lid for easy filling and cleaning. The whistle lets you know when the water is ready. The thumb press spout lets you tip, open and pour easily. You simply flip the cover up and it stays in place. You can pour the water with or without the spout cover whistle piece being down over the spout. It pours well and does not splatter hot water while pouring. The exterior is a colored porcelain Empire Red over stainless steel. This kettle is high quality and looks good enough to get multiple comments from your friends. This is another stovetop kettle suitable for gas, electric, induction or glass/ceramic stovetops. The 2.0 Quart capacity is within the stainless steel construction coated with the colored porcelain. ⇒ Click Here for an excellent price on this KitchenAid kettle. The aesthetic appeal of this kettle is the C-handle. The shape looks good and the handle is covered in a comfort grip making it practical. Personally, I love the look of the C-handle. If you like it too, this is the kettle for you! Similar to the last stovetop kettle, this one also has a thumb press spout making it easy to pour. You’ll find the removable lid makes it easier to fill and clean. Overall this is a popular kettle because it looks good, it works well and the price is right. For the price, Click Image. If you don’t like the C-handle on the kettle above then take a look at this KitchenAid version with a full handle (on the right). This stovetop kettle is similar to the previous one but it has the button on the top of the handle to let you flip open the whistle cover for pouring. The capacity is 2.0 Quart and it comes in Empire Red like the previous ones. The lid is removable. The kettle whistles when your water is boiled. It’s an iconic look and will suit any kitchen. If you prefer a full handle this is the one for you. 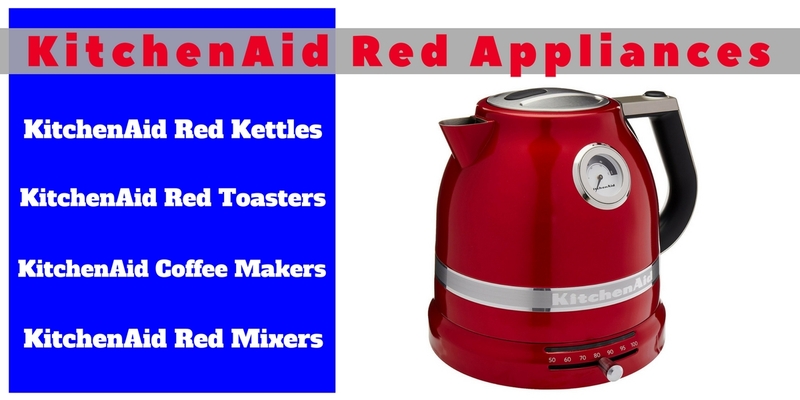 What are the best KitchenAid red appliances to complement your kettle? Toasters, of course! Whenever I buy a new kettle I buy a new toaster in the matching color. I leave my kettle and toaster on the counter so they become a feature in my kitchen. This is why I think color is so important. Maybe you just like the high quality and practicality of Kitchenaid appliances, but I’m all about the color too! Hopefully you see it the same way. First we’ll look at the Candy Apple red toasters. 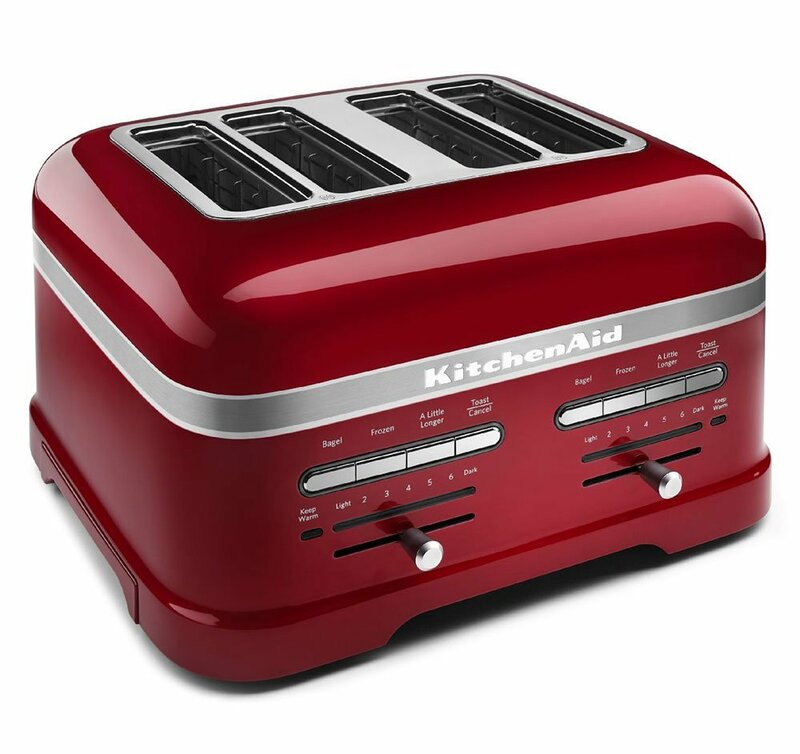 This KitchenAid KMT2203CA Toaster is a 2-slice toaster with the red color all over the exterior (when we look at the Empire Red toasters below, you’ll see that they have a lot more silver color on them than red). ⇒ For more details, and price, on this toaster, Click Here. 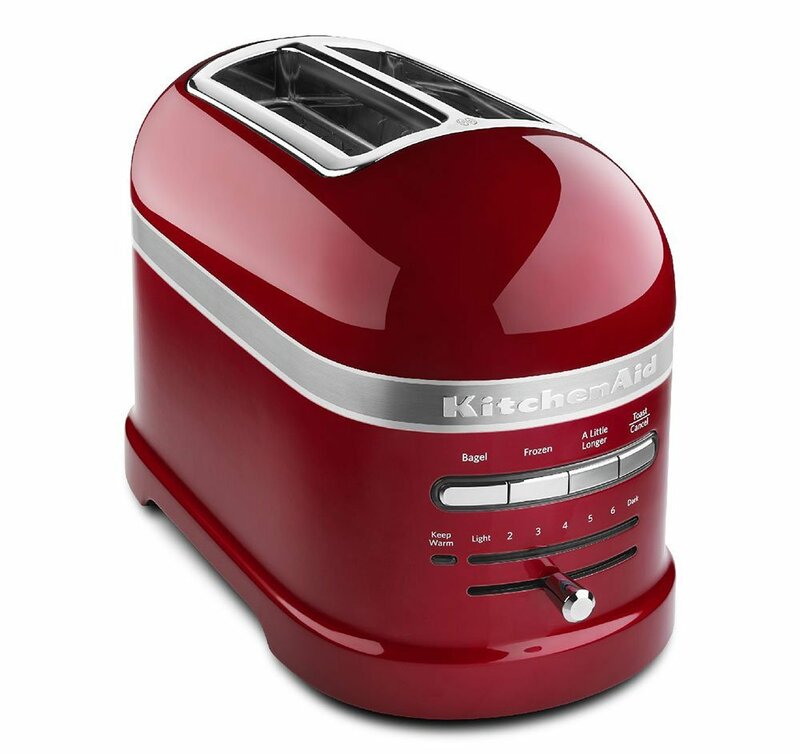 This Candy Red KitchenAid toaster gives you 7 toast settings, a bagel option and defrost button. You also have the little-bit-more-button (which I always find handy). One of the best features about this toaster is that is has an automatic function to keep toast warm for up to 3 minutes after toasting. This keep warm function is great when you’re rushing about trying to get ready in the morning and your toast is getting cold because you get distracted longer than expected (this always happens in our family). Have you noticed there’s no lever to push your bread down? This is an automatic lift and lower toaster which means it will automatically lower the bread into the toaster when it senses bread in a slot. And it will automatically lift it when done. This is a high quality KitchenAid red appliance, the appearance is beautiful, it functions like no other toaster and you’ll enjoy owning it. If you can afford it, buy it. ⇒ For the price on this 4-slice toaster, Click Here (beware: it’s expensive). Have even more money to spend? Get the same model as above in the 4-slice version. Similar features, but you can toast 4 slices at once. Each side is separated so you can select different settings or toast different items like bagels in one side and bread in the other at the same time. Do you like lightly toasted bread and your spouse likes darker toastiness? This toaster is great for two people because with two different sides you can choose different settings at the same time! Obviously this toaster has all the amazing features, like automatically lowering your toast when it senses its presence. And it will keep the toast warm automatically for an extra 3 minutes. But let’s face it, most people buy it because it looks amazing on your counter. Look at all that lovely red. Very impressive, in many ways. If you want to own one of the best KitchenAid red appliances available, this toaster is it. ⇒ For the price, Click on each image above. Both of these toasters have extra wide slots of 1.5-inches. The long slot toaster is great for longer pieces of bread or toasting 4 slices. Each of these models has 7 settings and buttons for bagel, defrost and keep warm. They also have a high lift lever. ⇒ Click one of the images above for more details. These Empire Red toasters provide 5 settings along with bagel and cancel buttons. They will complement your Empire Red kettle even though they have a lot more silver color on them. If you want to show more red simple turn them sideways on your counter, voila! They both have extra wide slots and a high lift lever. With the bagel button you can reduce the power on one side of the heating elements by 50%. This lets you gently brown the bottom of a bagel while toasting the side that’s sliced. On the 4 slice model you get independent controls so you can toast one way on two slots and anther way on the other 2 slots. All of this at the same time. ⇒ Click each image above for more details and price. These are the KitchenAid red appliances you’ve been looking for with LED displays. They even include a countdown timer. The digital display’s progress bar lets you know when your item will be ready to enjoy. You’ll get extra wide slots along with bagel, defrost, reheat, toast/cancel buttons. If you like the idea of a countdown display, this is your toaster. 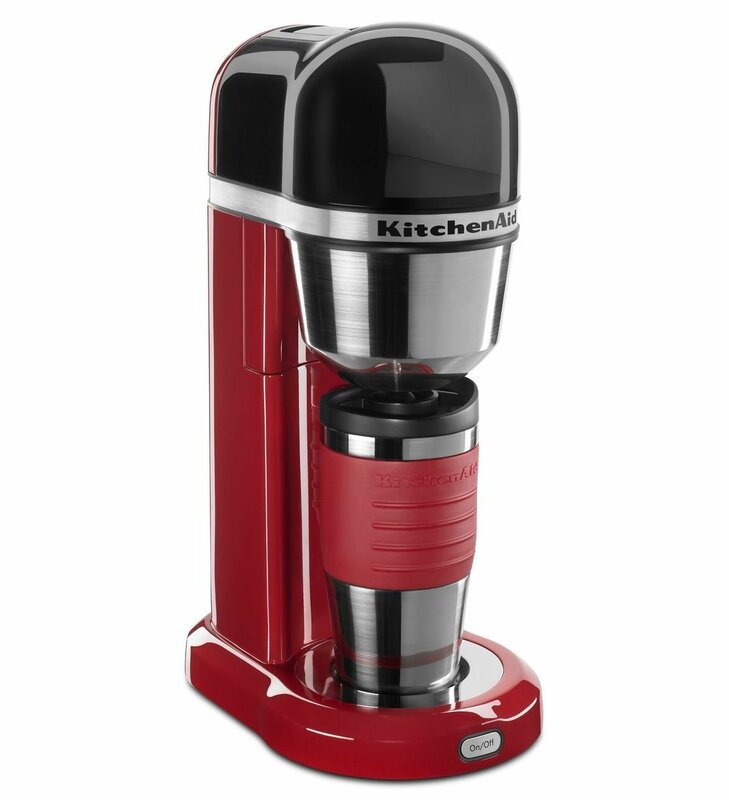 Do you love the thought of waking up to fresh coffee from your red KitchenAid coffee maker? Here are some of the best KitchenAid red appliances you can find. ⇒ For an excellent price on this Nespresso, Click Here. 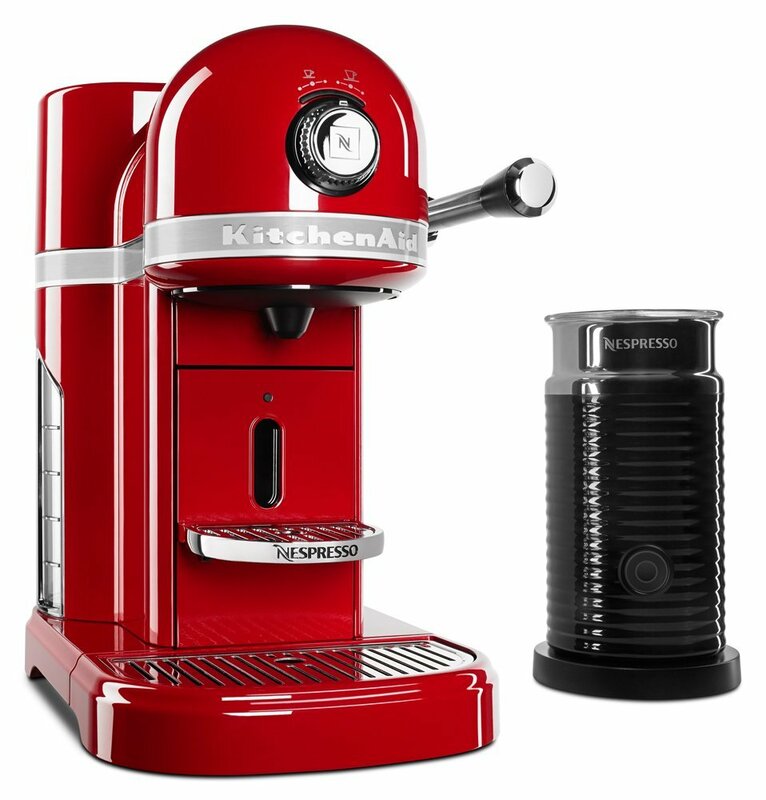 This KitchenAid Nespresso machine is 1160 watts and comes in Empire Red to match your other KitchenAid red appliances. There is a brew strenght selector and a 1.3 liter removable water tank. You can buy it with a milk frother and a set of Nespresso capsules. It is made from all-metal die-cast construction. This coffee machine is not inexpensive. But if you can afford it, you’ll love it. Easy to load Nespresso capsules make this your easiest option for that first cup of coffee in the morning. ⇒ Click Here to see more details and the price on this coffee maker. This coffee maker is a combination of manual pour over coffee with the convenience of not having to do it all yourself. You get different settings to allow you to taste all the subtleties of flavor within medium to dark roast coffee beans. This coffee maker has advanced heating technology and automated pour over brewing technology. It meets the Gold Cup standards of the Specialty Coffee Association of America (SCAA). It makes 2-8 cups of coffee at a time. You can program it up to 24 hours ahead giving you the convenience of early morning coffee when you wake up. This is one of those KitchenAid red appliances where you’ll appreciate the result as well as the color. The coffee it makes is good. This is not a fast way to make your coffee. It is the real pour over coffee process. It takes a little bit of time. But if you program it ahead of time your coffee is ready to go in the morning and you don’t even need to make it, this coffee maker does it for you. ⇒ For an excellent price on this personal coffee maker, Click Here. This personal coffee maker is perfect for one or two people. The Empire Red will match your other KitchenAid red appliances. It comes with the travel mug and the coffee can be made to go directly into the cup so you can grab it and go. If you prefer, you can use your own mug with this coffee maker. You place the ground coffee into the filter and the water in the reservoir on top and it only takes 5 minutes for your coffee to be made. This is an easy way to get good flavor coffee. 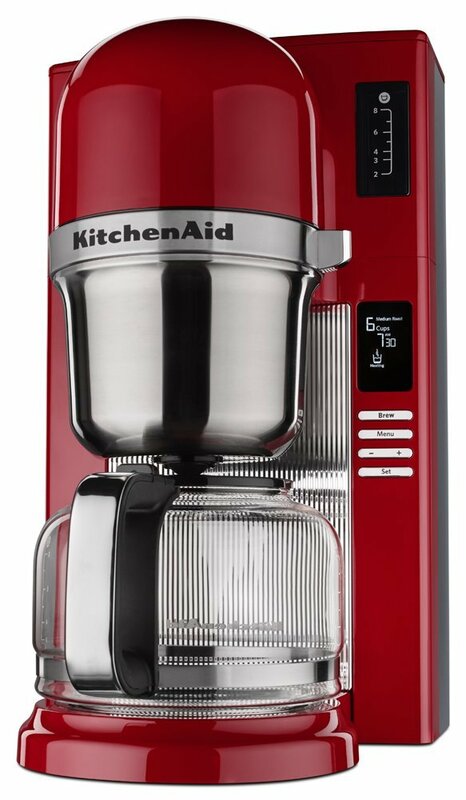 This is one of the KitchenAid red appliances where you get bang for your buck. It is a reasonable price for a high quality product. It includes a gold tone permanent filter along with the 18 oz thermal mug. You’ll get barista style coffee with the convenience of one-touch brewing. Whether you need a Burr Coffee Grinder or a Blade Coffee Grinder, KitchenAid red appliances offer both. You can see in the images below that there’s a big difference in price. But you’ll know what you prefer so I won’t try and sell the concept of a burr grinder here! You can also get a replacement KitchenAid travel mug for the personal coffee maker or just to have one to use otherwise. These look very stylish in the red color whether you want to keep your coffee warm at home, on the way to work, in the car or for any other reason! They also make a pretty gift for someone. 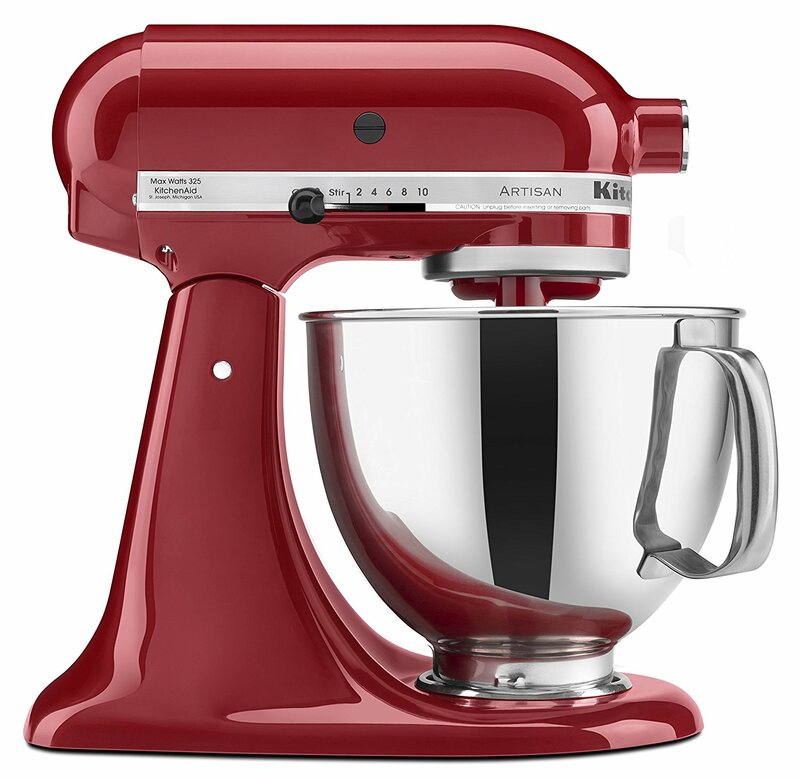 When I think about KitchenAid red appliances, I first think of the mixer. 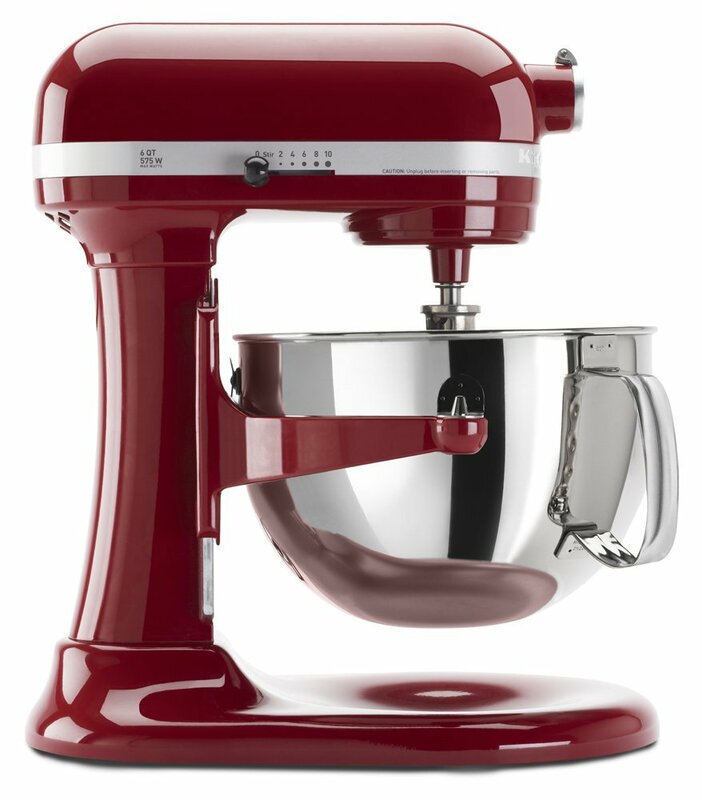 This 5-quart stand mixer comes in Empire Red. It includes the tilt-head and pouring shield. This is the iconic stand mixer that everyone loves to see in a kitchen. The power hub on these mixers can be used with 15 different optional extras to turn your mixer into a culinary center! The 5-quart stainless steel bowl is included and it has a comfortable handle for lifting. The 59 point planetary mixing action means there are 59 touchpoints per rotation around the bowl for thorough mixing. You’ll get the coated flat beater, the coated dough hook to make bread dough, 6-wire whip, and one piece pouring shield included. The Artisan series runs on 325 watts of power. If you’re looking for more power, see the Professional 600 series here. And if you don’t like red there are more than 20 colors available (see colors here). ⇒ For the price on this Professional 600 mixer, Click Here. Need a bigger bowl? Get this Professional 600 Series mixer. KitchenAid red appliances have gone one step further with this stand mixer raising the bowl to the lifted position. Not only functional, this stand mixer looks great sitting on your counter. It runs on 575 watts power. It comes with the 6-quart stainless steel bowl with comfort handle along with the burnished flat beater, powerknead spiral dough hook, wire whip, and one piece pouring shield. This is a high quality mixer and one you’ll use for years to come. This is one of those KitchenAid red appliances that make memories. Involve the kids in the kitchen or bake with a loved-one. When you use your red KitchenAid mixer you’ll be enjoying the important things in life. To see the colors available for this Professional 600 Series stand mixer, click here. There are different red colors and lots of others available. Need bigger? 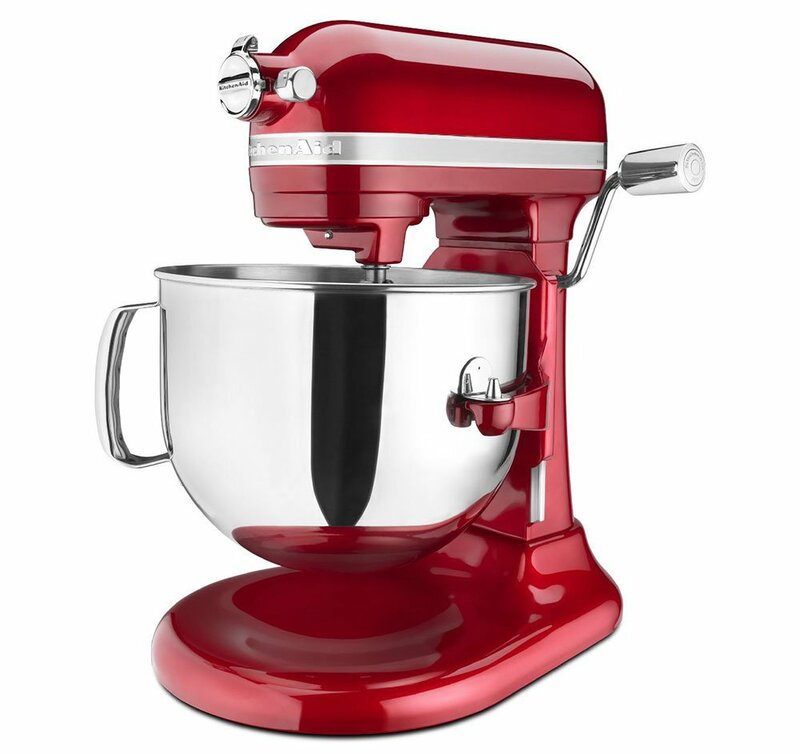 Here is the Pro Line Stand Mixer in Candy Apply red. It has a 7-quart capacity. ⇒ Click Here for today’s price on this 7-quart stand mixer. This is the largest residential bowl lift stand mixer available. If you need the bigger capacity get the 7-quart. You get the iconic KitchenAid mixer look and the lifted bowl. KitchenAid red appliances look great in any kitchen. They also make great gifts for anytime of the year. If you know someone who would appreciate one, this makes gift shopping easy! And if you looking for the perfect new appliance for yourself, I know you’ll find one (or more) items to love. ☑ Looking for the ultimate induction cookware set? Read more here. ☑ Do you like convenience in your kitchen. Time to get an Instant Pot. See here. ☑ Love the elegance of a round chafing dish? All the details you need here.